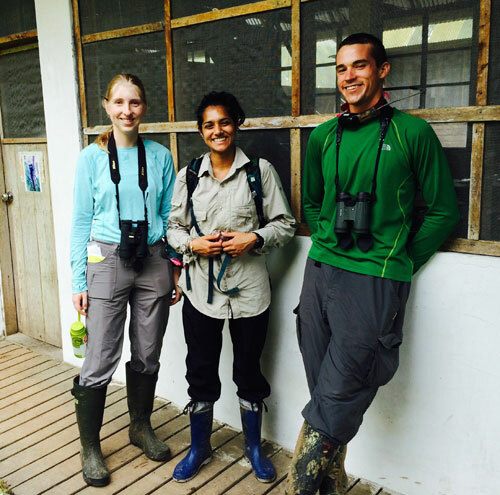 Field Projects International offers students the unique opportunity to receive hands-on training in the Peruvian Amazon. We partner with several universities to carry out a number of long-term research programs. Our primary subjects are the primates at the Los Amigos field site in the Madre de Dios region of Peru, with research topics including growth and development, life history, health and parasitology, reproduction, space use, and communication. All of our research programs contribute to the student training opportunities that we offer, especially as platforms for learning for our long-term research assistants. We specialize in teaching field research methodologies applicable to small mammal capture-and-release, parasitology and health monitoring, behavioral observation, tracking and space-use, and communication. Research assistants come from a variety of backgrounds — pre-vet, anthropology, biology, and young professionals — and may participate in one or more of the research programs we offer. If you are interested in joining a field research team, you’ve come to the right place. We are an equal opportunity organization; we do not exclude candidates who lack previous field experience. Joining our team is a competitive process, but extends generous support for participants in pursuit of further opportunities to conduct research or join graduate programs. This training program targets students with interest in wildlife handling, zoology, or veterinary science. Students will participate in annual capture and release programs focused on nonhuman primates, bats, birds, and small to medium size terrestrial mammals (rodents, marsupials, armadillos, tayras) in southeastern Peru. Participants will work alongside several wildlife biologists and veterinarians obtaining opportunities to handle a variety of mammalian and avian species, gaining valuable knowledge of their biology, learning to record morphometrics, collecting and processing a variety of samples, and becoming competent in several roles that are vital to a successful health screening program. Our work in this project is sanctioned by the Amazon Conservation Association, the Animal Care Committee of the University of Missouri, St. Louis, and the Servicio Nacional Forestal y de Fauna Silvestre (SERFOR) in Perú. Training areas: Animal mark-recapture and handling, health assessments, vital signs monitoring, morphological measurement, sample collection and storage. Tamarins are notoriously difficult to track and identify in the wild, because of their diminutive size and morphological homogeneity. 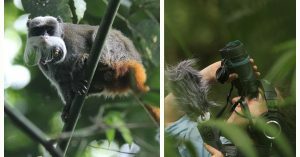 In this program, we monitor a population of ~14 tamarin groups, individually identifiable and radio-collared, to study their space use and means of communication. We collect data on adult scent gland morphology and scent-marking behaviour, another primary form of communication among tamarins. Participants will conduct full- and half-day follows of individually tagged primate troops, recording alarm calls and scent-marks alongside habitat use and feeding ecology. Training areas: Off-trail navigation, wildlife tracking, telemetry, focal behavioural sampling, spatial analyses. Primates are often heralded as a group of mammals that rely more on their vision than their olfactory senses, however, olfaction is a strong feature of tamarin communication. In this program, we will use two types of experiments to assess the strength of the olfactory system in tamarins. First, experiments to detect communication of gender, familiarity and breeding status via glandular secretions in urine. Second, feeding experiments to detect the constant battle between visual or olfaction-dependent foraging. Participants will learn how to conduct the experiments, record behavioural data, and perform fundamental data analyses in the field. They will also actively participate in experiment design and troubleshooting working closely with the wildlife handling team. This program was launched in 2012 and is now one of the most comprehensive studies of blood and gastrointestinal parasites in South America. We use microscopic and genetic tools to evaluate parasite infections in non-invasively collected faecal samples. 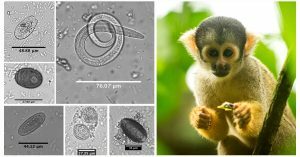 With baseline data on parasites from 11 primate species at CICRA, we can monitor community interactions, health, and population stability, animal behaviour, and whether climate change may be altering parasite-host relationships. In this program you can opt to complete the field component, lab diagnostics component, or both (gaining experience no only collecting samples, but conducting microscopy and molecular screening techniques). 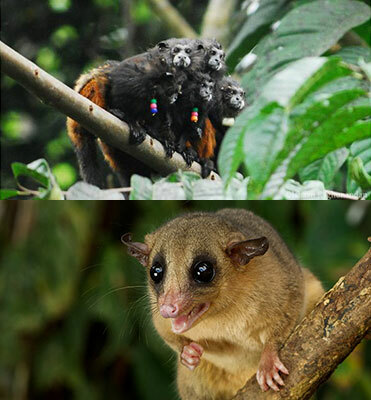 You’ll help us maintain crucial longitudinal data collection on the local primate assemblage, and usher in data from new taxonomic groups. Among the many questions we hope to tackle with these data, our principal goal is to expose new ecological linkages between Neotropical animals. Appeals to majors: Anthropology, Evolutionary Biology, Veterinary Science. Training areas: Sample collection and preservation, off-trail navigation, telemetry, land-use mapping, census data collection. This summer FPI is focusing on deploying a number of technologies that will automate data collection at the Los Amigos Field Station. We are looking for a few research interns to be part of the deployment, testing, troubleshooting, and validation team. The team will be led by FPI’s Documentary Photographer and Technology Engineer, Ishaan Raghunandan. The cost of joining this program is the same as our other research assistantship programs, $450/week, and includes local transportation to and from the field site, food and lodging, and technical training. 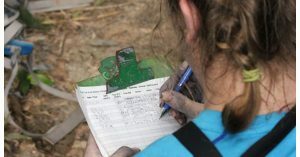 At the conclusion of this program you will have helped in establishing the following new wildlife technology systems at the Los Amigos Biological Field Station: Weather system, and all-in-one camera trap+RFID reader+weigh scale, local network for remotely accessing data from all deployed devices. Read the full program announcement. Program fee: $900 for 2 weeks; $450 each additional week. Remember that baggage charges are extra these days. Check your airline’s website for online purchasing of baggage claims as it’s often cheaper than paying for your bags in person at the airport. Typically, Perú does not allow more than 2 checked bags. However, Spirit now only allows a single checked bag, so confirm with your airline before you travel. A flight to Puerto Maldonado is the shortest and most efficient way to get across the Andes, but it is also more expensive. A well-known public airline, LAN, charges higher rates for foreigners and it costs ~ $300 (roundtrip) to get to Puerto Maldonado. All bookings must happen over the phone or online, and their website is reliable and will accept foreign credit cards. Other airlines include Taca (tickets can be purchased through the websites above) and StarPerú (tickets can be purchased only through Star Peru’s website, which is fairly difficult to navigate). The advantage with either of these airlines is that they are roughly a hundred dollars cheaper to fly. This is a crucial step because it is very rare to be able to catch a boat on the day of your arrival. For all of our programs, we will pick you up from the airport and put you up in a hostel in town. However, if you have family visiting or want to extend your stay or arrive early, here are a few good hotels to choose from: Perú Amazónica (family-run, no website, email is: peruamazonico(at)hotmail(dot)com) and Cabaña Quinta (larger and more well-established, thus crowded, has its own restaurant, has its own website). A good hostel is the Tambopata Hostel which can be booked on hostelworld.com. Navigating Puerto Maldonado is quite simple – it is the departure point for a variety of eco-lodges in the area, and thus, it is full of small restaurants and cafés mostly located along the main street, Jiron Velarde. You can walk almost anywhere in this town, but if you need to you can take a small motocar (three-wheeled tiny taxi) for 2 soles (~50 cents) anywhere in town. Your ride from the airport to your hotel in one of these should cost less than 10 soles (~$3), and is reimbursed by the program. In all of our programs, we will assist you along this leg of the journey. This trip is short, ~45 minutes, and takes you along the interoceanic highway to the small port town of Laberinto. A private taxi costs 50 soles or so for this trip, but we will cover this fee. There are two ways to travel to the Los Amigos Biological Field Station – by the station boat or by the collectivo, or local boat taxi. Although it used to be a slower option, there are now a series of fast boats that provide a much more colorful ride. For all of our programs we will organize a collectivo for you to use. Boats leave early from Laberinto as well as from the field station for the return journey. Never book a flight for the same day as your boat into town. If you join any of our programs, you will receive further information on vaccines, waivers of liability, participation contracts, currency, and other travel tips. This is important, if you’re not a Peruvian citizen. Peru does require visas and getting them can be quite complicated. No visa is required for a visit of up to 183 days. You can get a stamp in your passport at the Lima airport. If you are staying for over a month make sure to ask for the full 183 days or they give you the default of 30/90 days. These requirements can be found here. Start the process early. You will need an airline ticket before you can apply. If you live in a city with an embassy then it should take about 3 days to get your visa. If you mail it in the whole thing should take a week. It costs approximately $30 to get a visa. They will require a bank statement with sufficient cash in a checking account before they give you the visa. Once you are in the country, you can get extensions for a month at a time at the office in Puerto Maldonado for a fee, but not for those with the maximum 183-day visa. At the very worst, you can overstay your visa and pay $1 a day as a fine. We have done this and it seems to be acceptable to the immigration folks. Unsurprisingly, there are health concerns involved in traveling to and living in a rainforest. Some simple precautions can ensure an enjoyable visit. However, things do go wrong and a visitor must have a clear understanding of what they are getting into before visiting CICRA. the nearest doctor is at least 4 hours by boat in Puerto Maldonado. you will have to go to Cusco, at least, for above-average medical care. in the rainy season, getting you to a town by boat, in the dark say, is fraught with risks so please, stay smart and avoid taking unnecessary risks. This is not Survivor. Or Man vs. Wild. Or any other staged show they invent next! DO NOT pick up snakes, spiders, etc. Seriously. There is anti-venom at the site but you will most likely encounter snakes in the forest, away from post-exposure medication, and if you are alone that will be the last stupid thing you do. Snakes are rarely spotted and are very afraid of you. Despite what you might have heard, you will not be attacked by anything in the jungle without provocation. The only people that have ever been bitten by a snake have been handling them – so don’t touch them on this project. Eat well. It’s the simplest way to stay healthy. Don’t be picky about your food, it’s just not worth it. Most people find this rule the easiest to follow because hiking all day makes you ravenous. The food is wholesome and good and there’s always enough to go around. So if there is one thing you do, eat well. Stay clean. This is another simple rule. You will get very messy following monkeys so it is likely that you will want to shower every day. However, the showers are from a really cold stream so sometimes, you might be tempted to skip them. The only way to beat the chiggers (confused? read on!) is by showering well and using soap liberally. Do laundry often and do it well. Soaking clothes in detergent doesn’t clean them so be prepared to scrub what you wear. NEVER reuse inner wear. The infections that can ensue will not only ruin your stay but will force us to have to ask a lot of embarassing questions. Get your vaccines up to date before visiting. For a list of vaccines reccomended for travel to CICRA see here. For exceptions to this rule see below. a. Typhoid (take it close to when you travel). Do not rely on a 3 year old vaccine – retake it! b. Yellow fever. A must. Available in Lima for 70 soles if there is a shortage in your own country. Your routine immunisation schedule also needs to be complete: influenza, chickenpox (or varicella), polio, measles/mumps/rubella (MMR), and diphtheria/pertussis/tetanus (DPT). We will need proof of these vaccinations before you arrive at the site. Malaria is not endemic to this site, (although it is present in Puerto Maldonado). Neither the station staff nor the research team takes regular malaria prophylaxis medication. This doesn’t mean, however, that there isn’t a risk of malaria at this site. The choice is yours and will depend on the type of drug you have access to. Drugs like Larium are once-weekly and have pretty sever side-effects. Others such as doxycycline are often prescribed daily for extended periods and will offer protection from malaria. Either way, please bring at least one post-exposure treatment course. This would be Malarone (contents: mefloquine). Check with your doctor about this. As for anti-malarial drugs the following are good options: Atovaquone/proguanil, doxycycline, or mefloquine. Chloroquine is NOT a good option for treating malaria in Peru. Halofantrine (marketed as Halfan) is widely used overseas to treat malaria. CDC recommends that you do NOT use halofantrine because of serious heart-related side effects, including deaths. Leishmaniasis is endemic to the site. Click here for details on the disease. In brief, it is transmitted by sand flies, too small to be really visible until you are already bitten. There is no vaccination for leishmaniasis, but wearing long sleeves and pants, and using repellent while in the forest, will reduce your chance of infection. If during or after your work at Los Amigos you notice an open sore or scab that doesn’t heal, get yourself tested for leishmaniasis.Testing is available in Puerto Maldonado. We know a couple people who have had it and have been treated. If you catch it early, which is imminently possible, the worst of it is an unattractive scar. The treatment provided in Peru is excellent although potentially expensive. Most tropical diseases are best treated in the tropics where doctors are familiar with them. Chiggers: This is from the CICRA website and nobody could say it better: “Outwit the chiggers. They’re a common nuisance at the station and can make your time here unpleasant if you’re not prepared. To avoid them, keep out of tall grass and brush, sit on your poncho in the forest, or treat your pants with a sulfur-and-talc powder mix, or pyrethrin (excellent). If you get them, you can kill them with Destolit (a topical permethrin creme) or a rubbing-alcohol-and-camphor mix (alcohol alcanforado in Spanish). All of the above are available in pharmacies in Puerto Maldonado.” You will get chiggers. They leave small scars that fade in a few months and they itch like the blazes. Eventually, you get used to handling them and it’s not so bad. DO NOT shy away from DEET-based insect repellant. You are welcome to bring herbal repellant to the rain forest but it is our experience that these are relatively ineffective, require to be applied several times during a morning’s hike, and are just not worth the expense. Nobody likes the thought of applying a chemical like DEET to one’s skin, especially on one’s face. However, it is FAR worse to end up with leishmaniasis because you are worried about long-term skin quality. This is our advice: One stay in the rainforest can mean that your body will never quite look the same, so forget the blemishes and be proud of your scars. They tell great stories. Your field clothes are important because we are off trail 90% of the time. You will want to be wearing long pants, a light long sleeve shirt, a light under shirt, comfortable socks, rubber boots (suggest buying these in Puerto Maldonado), and perhaps a hat or bandana. We do laundry about once a week at the least, so make sure you have enough clothes to last you that long. Also, certain things like pants can be warn several days in a row without changing them. Other items, like sweaty shirts, socks, and underwear we change everyday. At least one set of cold-weather clothes (temperatures can drop below 10°C in April-September and canoe rides in the rain are cold year-round) – bring sweatpants, warm socks and a sweatshirt or two. Rubber boots/ gum boots – knee high boots to hike in. These allow you to cheerfully wade through swamps and also prevent snake bites from the knee downwards. You’ll find them for cheap in Puerto Maldonado but if your feet are unusually small, buy these at home. A light rain jacket or poncho, whichever you prefer. A first-aid kit with antibiotics (Cipra is preferred), painkillers, anti-diarrhea medicine, anti-fungal creme, band-aids, topical antiseptics, a venom extractor, antihistimine, epinephrine (an Epi-pen), ear infection topical treatments, vaginal infection creams, etc. (no medication is provided by the station). You will not find all of this in one kit. Make your own and be generous. Bring all regular medication that you take including feminine care because it is not available in town. Sunscreen and insect repellent (bring something with DEET in it. The herbal, organic stuff just doesn’t work, see above). You will not need sunscreen everyday because you’re in the shade under the canopy for most of the time. Boat rides will require it, however. These things are not available easily close by so stock up. Alcohol alconforado or camphorated alcohol, sold at a pharmacy in Puerto Maldonado, usually separately as medical alcohol and small squares of camphor. This really soothes chigger bites and is cheap and easy to use. Low-impact laundry soap (bath soap is provided at the station in dorms only): go for a bar of soap rather than powdered detergent as wasps really like the powdered stuff and tend to sting the owners frequently. If you can use biodegradeable detergents, soaps and shampoos only. You must bring your own bedding for a single bed. These can be bought in Puerto on your way to the station. You will want at least one good blanket, 2 pairs of sheets and a pillow. Two pairs of sheets are important – things take a while to dry at the station and you do not want to be stuck without any sheets at all. A light daypack to take to the field with you. Make this small with one or two compartments – you will hate your pack if it is heavy while empty! A water bottle with a nozzle if possible, so you can drink quickly and easily on the fly. Avoid stainless steel and go with plastic because the former tends to smell a bit funny after a while in the jungle. A pocket knife of some sort. 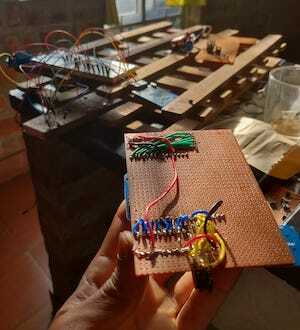 A small LED operated headlamp for reading books in bed without attracting every bug in the jungle to your face. Make sure your shampoo and creams aren’t excessively perfumed. The nicer you smell the more you get bitten. Binoculars – very important! You need a good pair or you will find yourself way behind the rest in the field. Spending the money on this is worth it. We use either the Nikon Monarch or the Nikon ATB Trailblazer at either 8×42 or 10×42. If you have questions or concerns PLEASE email us well before you travel. DO NOT show up at the field station without binoculars or with a pair with low-magnification! We will not provide you with these and you will NOT be effective in the field. Laptop: Your personal laptop will survive the jungle. We have pelican cases for electronics so feel free to bring them along. Bring a batch of silica gel or drierite to keep your personal electronics dry. A laptop is your only connection to the world outside and will serve you in many ways. A camera: If you have a really good camera you definitely want to consider bringing your own pelican case and silica gel. Do not count on taking your DSLRs out to the field everyday – this is risky and can harm the machine. However, there will be plenty of opportunity to use them – camp is right in the jungle after all! A digital wristwatch: This is absolutely necessary. Also, don’t buy it the day before you leave – try to learn its functions before you get here. It must have a stopwatch and alarm on it. Towels: these are not provided at the station. Quickdry ones don’t work all that well in that much humidity so bring some cheap towels you can toss at the end of your stay. Toiletries case: you might be sharing restrooms and will have to have some way to bring your things in every evening. Ziplock bags: essential to store batteries, food, passports and anything else valuable. Bring small ones and double bag everything. American passports in particular tend to mold within weeks in the jungle unprotected. Extra contact lenses and plenty of lens solution. It is safer to leave your lenses in for a few days in a row than to stick your fingers into your eyes twice a day. You might consider practicing with your lenses on while you sleep before coming to the site. Extra pair of rubber boots in your size. Mark them with your initials using paint or something waterproof and permanent. This way, they won’t get mixed up with the station’s supply of boots. Books to read: there’s a lively book swap going on at the site’s library so you will most likely find things to read. Academic reference books, should you think you need any. Accessing journals online is practically impossible. Chocolate and peanut butter – feel-good stuff is hard to come by. Also bring somethign airtight to keep the bugs away from your private stash. A bathing suit. Really, there’s a lot of stuff in the river that can eat you or parts of you. People still swim and people still get eaten. So I’d leave the suit behind. Anything electric that you could do without. This includes hair-dryers, irons, and most definitely, electric toothbrushes.Plugpoints are sought after and you charging your toothbrush when you clearly have at least one arm is going to be irksome. In order to apply for a research assistantship you must submit an application. Do not wait till the deadline to turn in an application - limited program slots may fill before then. Read about our eligibility requirements and the application process in the section below. Must be willing to adjust schedule to primate daily activity patterns. This can require doing full-day follows. Important: All applications are processed as received until all spots are filled. Applying early definitely pays off. Want credit for independent research? Please contact us at info(at)fieldprojects.org AFTER submitting a research application. Feel a little under-prepared? Consider taking one of our field courses before beginning your assistantship. Can I stay for shorter or longer than the minimum specified per program? There are pretty firm minimum requirements for each program (3- to 6-week commitments). These are firm because each research assistant must be trained, during which time the data they collect cannot be relied upon entirely. Anything less than the minimum time is deemed insufficient for the research assistant to contribute real data to the project. However, for most programs, you are welcome to apply for stays that are longer than the minimum period – in fact, we really do recommend and love it when you do! Why are there specific start dates? In order to train our research teams, it is necessary that everyone arrives on specific start dates. However, for some programs we are able to provide multiple start dates in order to accommodate the varying schedules of our research assistants. Note: this is not offered for all of our programs, so please pay attention to the specific start times for each program. If you REALLY cannot make a particular start date, don’t abandon hope – email us and we can do our best to accommodate you! What if I want to do both a course and the research assistantship? Which is easier to get into - a course or the research assistantship? Our courses have fewer enrollment requirements, and we strongly encourage anyone to apply. The research assistantships are more competitive, and there are fewer positions available. Do I need previous field research experience to be a research assistant? No, you do not need previous research experience. We value enthusiasm and determination, and we will be proud to be your first foray into the world of field research. What does the cost of this program cover? The cost to participate includes lodging and all meals at the field station, transportation between Puerto Maldonado and the field station, specialized training for candidates accepted into the program, and the provision of equipment and supplies necessary to conduct this research. A large portion of the fees paid to our training programs supports our host field stations. For example, at the Los Amigos Biological Station (El Centro de Investigación y Capacitación Río Los Amigos, CICRA), you are not just supporting the cost of running and maintaining a remote field site, but also funding the larger mission of the their parent NGO, the Association for the Conservation of the Amazon Basin (ACCA). We are now able to offer a peer-to-peer fundraising program for research assistants. Once accepted, you would be able to create a shareable profile on our platform. This is a team-based initiative, so half of your raised funds will go toward your own program fees, while the other half will go into pool to be split evenly among all program participants who had at least 5 donors. More details will be available during (and after) your interview. If you require help with the cost of the program, there are other options that you might pursue as well. You could start by contacting the Office of Undergraduate Research at your school. Here you can explore what is available through your college, as well as through external funding sources. Many universities have SURF (Summer Undergraduate Research Fellowship) programs, which may provide stipends for students to pursue independent research. Please note that if you do find any kind of research-related funding — as many RAs have in the past — it will need to be applied for in conjunction with us, on research projects that we approve. In this case, one of our principal investigators will consult with you about developing a project that is feasible. Can I conduct my own research project with you? Question cont’d: I have an opportunity to win a grant that will fund my research assistantship site fees and travel. However, the grant needs me to submit a research proposal. Is there any way I can work with you to generate a proposal? Sure, contact us at info(at)fieldprojects.org and we can help you structure one. We cannot accommodate independent projects, but we can assist you with finding a compatible section of research to work on with us. Can I receive credit for research conducted through this program? Will I get a chance to work on publications that come out of this research? Yes, you can. We do not give co-authorship for collecting data alone, but we offer interested students the opportunity to work on data analyses after the summer research program, that could lead to co-authorship in the future. What are some of the things previous assistants have done after the program? First, they graduate! They have subsequently gone on to graduate schools in primatology, conservation, and biology. Some have interned as assistants in other programs all over the world. Some are training to be veterinary surgeons now, and one even runs an amazing animal rescue center. We are proud to support their futures and careers. Learn more about them on this page. If you have extenuating circumstances, or applied closer than 45 days to your start date, please contact us to confirm your specific cancellation policy. What are the steps to becoming a research assistant? 5. Upon acceptance, gain student access to online training modules to get prepared before you arrive. 6. Turn in medical info, vaccination record, liability waivers, etc. 8. See you in the field! Concerned about the Zika virus? The Zika virus outbreak is of acute concern in much of Latin America, although a great deal is still not known about this virus. It is spread by the Aedes aegypti mosquito and there is a possible link to a condition called microcephaly in children born to infected women (although it does appear that Zika-caused microcephaly in Brazilian infants has been over-diagnosed. While mosquitoes are the primary vector of the virus, a recent case in Dallas has also confirmed that the virus can be sexually transmitted. Presently the CDC’s travel advisories for pregnant women do extend to areas below 6,500 feet in Peru, which includes the Amazon basin and any field station in it. Our recommendation is that participants who are pregnant — or likely to be pregnant during their time at the field station — use caution and avoid traveling at this time. If you are not pregnant but are thinking of having a child in the near future, the CDC recommends waiting 8 weeks post potential exposure for women, and 6 months for men. All participants can protect themselves by taking precautions against being bitten by mosquitoes. Between 2016 and 2017 (Epidemiological Week 5), confirmed autochthonous cases have been reported in six of Peru’s 25 departments: Cajamarca, Lima, Loreto, San Martin, Tumbes, and Ucayali. Three of these six departments, have reported autochthonous confirmed cases only in 2016: Cajamarca, Lima, and Tumbes. neurological syndromes have been reported by Peru health authorities. reported by Peru health authorities. As of EW 5 of 2017, no deaths among Zika cases have been reported by Peru health authorities. This is a developing story, and much is still unknown regarding the transmission and health risks of this virus. We recommend that each prospective student and researcher determine their own comfort levels by weighing the available data against their own relative risk. At this point, FPI’s non-pregnant investigators and other staff remain confident about safely returning to the field station given that Zika has not been detected in the entire Department.